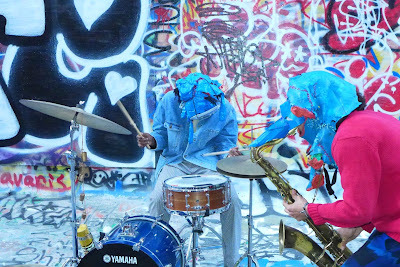 Described online as a “nebulous jazz ensemble”, the Onyx Collective is a variable group of young, self-confident New York musicians with a knack for developing an underground following. Their first release, 2nd Ave Rundown is only available on vinyl and a second, Lower East Side Suite was recorded on an iPhone in shops on the Lower East Side of Manhattan. This was their second performance in a three-date visit to London, and the band were undaunted, even cavalier about appearing at Ronnie Scott’s, projecting a cool-headed New York attitude tempered by some fiery playing. Saxophonist Isaiah Barr led from the front, with a sound that began as enigmatic and serpentine before developing into keening and wailing as he gyrated like Charles Lloyd, on a boat, in a storm. His tenor was very heavily amplified, with mixed results: whilst it allowed softer sounds to be heard clearly over Daryl John’s sustained, meaty bass sound, and the big reverb on his mic gave the band’s sound an epic quality, after a while it was simply too loud. There was also very audible electrical noise coming through the speakers during the (fairly rare) more intimate moments, apparently emanating from Barr’s red-hot sax microphone. His alto, by contrast, seemed to struggle to reach the same sonic heights and felt lost by comparison. On both horns, he seemed to be reaching for a Coltrane-esque epiphany of sound, circling and returning to single notes and spending long passages in the hard-edged upper register. The set began with a long, explorative piece in free time over a drone created by a digital version of Shruti box, a drone-making device from Indian classical music. Arabic and Eastern influences were audible in the playing of all three musicians, with Barr and Johns decorating their restless lines with melismas and ornaments reminiscent of a muezzin intoning the Adhan. The band then alternated between passages of open time with dark, modal swing and occasional allusions to conventional changes, without ever really settling into a fixed pattern. Throughout, John’s consistently delivered inventive lines laced with intricacy, stepping effortlessly from trippy broken-beat groves to muscular walking bass at hyper-caffeinated tempos, and occasional moments of humour. He and drummer Austin Williamson formed an effective and communicative partnership, with Williamson generally taking more of a supporting role, only occasionally becoming the main focus. This was a band clearly projecting ‘attitude’ as hard as they could. Playing the majority of their set without a break or any spoken introductions, pieces blended one into the next and recognisable themes were rare and fleeting, until late in the set, when vocalist and guitarist Nick Hakim joined the trio for two surprisingly simple and tender numbers, displaying a quirky and intimate falsetto vocal style which was a welcome contrast. Johns provided the main highlights of the set, with a smattering of fluid solo moments demonstrating a taste for classical voice-leading and a wide, singing tone, as well as periods of stuttering, funky odd-time grooves. His assertive presence kept things going during a mid-set lull when some sections of the audience seemed to lose interest as Barr started playing his sax without his ligature, playing just the mouthpiece and playing two saxes simultaneously. The sustained intensity of Barr’s mantra-like playing was physically impressive, but none of these extended techniques was explored with enough expressive range to make them feel like a truly valuable addition to the band’s palette, which too often strayed into angry posturing, rather than the transcendental street-cool which their drawling aloofness seemed to be reaching for. This was a band which lacked nothing in confidence or in technical ability, but I was left wishing they’d been a little more willing to coax and cajole, rather than just bristle with New York attitude.